This is the tape of the first lecture of Ancient Israel. In this particular lecture I just want to cover a few points. First of all the purpose of the class, why do we feel it's necessary to have a class in this subject matter, when at least for the students here at the college you presumably or almost all of you or all of you have had a class in Old Testament survey and the answer to that is that just as the name implies, Old Testament survey you have surveyed a vast body of information without being allowed to get into a lot of depth in very much of it. The table of contents below is only a rough summary of the course material. 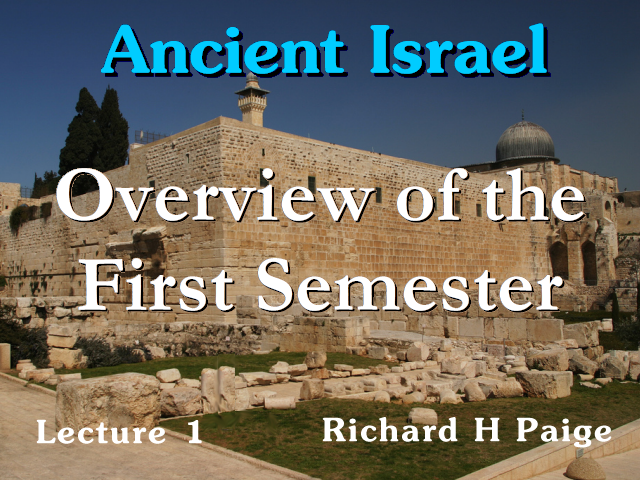 The History of Ancient Israel course was given in a classroom setting with time constraints, sometimes subjects carried over to the next lecture. Please also note, the lecture notes (PDF) are from the 1988-1989 class years which do not match the lecture 1986-1987 class years on our website and are supplied for reference only. If you have a copy of the correct notes we would appreciate it if you would let us have a copy. Please use our contact link at the bottom of this web page.